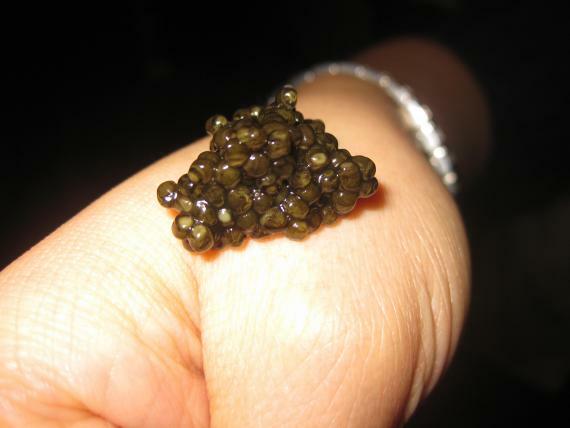 Numerous cookbooks offer ways of serving sturgeon caviar, from the simple to the extravagant and the outlandish. The following articles demonstrates the basic considerations involved and reviews the basic principles of garnishing with caviar. One of the fundamental questions on how to serve caviar, is whether or not to mask the natural flavor. There are many recipes which suggest accompanying or garnishing caviar with strong flavors provided by finely chopped white or green onions, chives, parsley, dill, spinach or lemon slices. Some of these may overwhelm the natural flavor of the caviar. Of course, there may be good reasons for masking the natural flavor: the caviar may be too salty, too fishy, might lack that typical, sweet, yolky flavor, or be slightly bitter. Caviar farmed from artificial waters, like the farms in Europe, very often suffer from the problems above described above, given that such farms have investor’s financial returns as a priority rather than the producing caviar of the highest grade. And hence, the poor quality caviar needs to be disguised with another flavour. In such instances one would experience only the ‘psychological enjoyment’ of eating the legendary product. Caviar of the highest grade should not be garnished at all but should be appreciated au naturel. 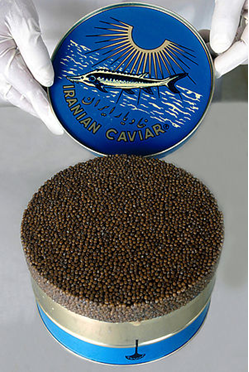 Given that sturgeon is native to the Caspian Sea, caviar farms in Iran or Russia that use waters from the Caspian Sea are of the highest grade. Iran’s sturgeon farms are famous for only using natural waters and foods from the Caspian Sea, unlike farms in Europe. The authentic and natural features of the pure Caspian Sea waters are the natural habitat of sturgeon fish and thus an excellent ecosystem that ensure the quality of the most exquisite delicacy. Cutlery: Knowledgeable consumers prefer their caviar to be served directly from the original jars or tins, which are embedded in a bowl of crushed ice. There are well established traditions in Iran regarding dishes and cutlery to be used. Decorative silver or golden bowls like the Iranian one below and cutlery were considered the ultimate dishes, celebrating the richness of the caviar with the value of sometimes ornately worked precious metals. However, any metal interferes with the delicate caviar taste. Glass or porcelain inserts to hold the caviar are recommended. Caviar is best handled with specially designed cutlery. The use of regular knives, spoons and especially forks which may damage egg membranes is regarded as sinful by experts. Flat spatulas made of ivory, horn, mother of pearl, porcelain, glass, plastic or hardwood are recommended. A special spatula with elongated openings was designed to hold slices of pressed caviar. Without those openings, the slice would stick to the spatula surface. One New York retailer became very upset with the way consumers handle caviar and, having a good sense of humor, established the ‘Society for the Elimination of Gaucheness in Serving Elegant Caviar‘. This is how he advertises the horn spoon. ‘How a man serves his caviar is indicative of his values and self-esteem. To plunge a utensil “helter skelter” into the beautiful beluga beads bespeaks carelessness … even hostility. Indeed, deliberate damage to the delicate eggs is nothing less than wanton boorishness. 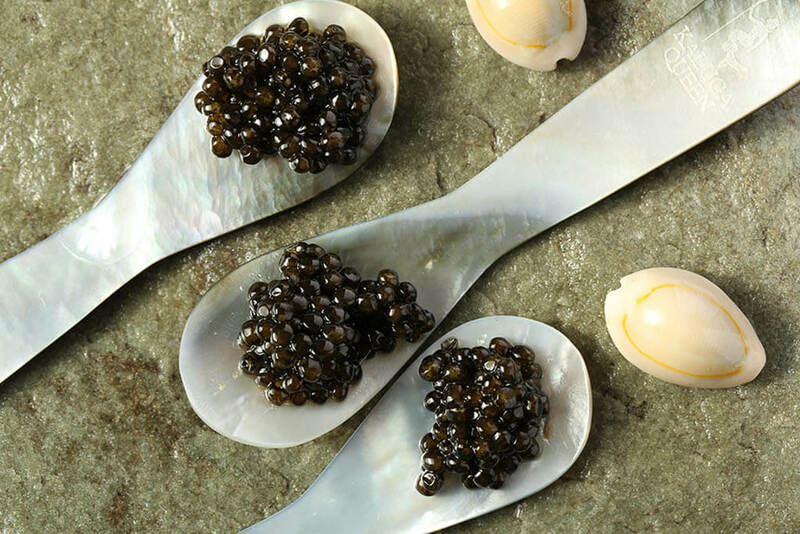 But to stroke the exotic roe with the blunted tip of a genuine horn caviar spoon … to scoop the gentle globules with grace and ceremony and deftly deposit them upon a regal canapé or blini, this is the mark of a man who cares … a man who dares.’ (Caviarteria Inc. New York. Leaflet, 1982). Drinks. 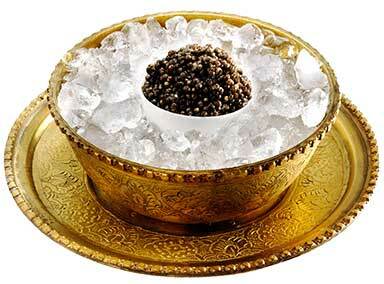 There is consensus about the best alcoholic drinks to serve with caviar. Dry vodka, semi-dry and dry champagne are the most often preferred, followed by dry white wines and mineral water. Gourmets drink the vodka or champagne to cleanse their palates so that they can best enjoy the natural flavor of the caviar. 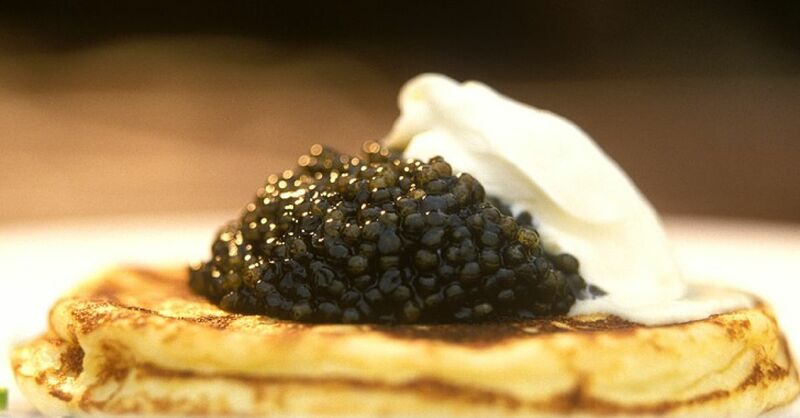 Some sources recommend serving caviar directly from the refrigerator, at temperatures of 4 to 6°C. Along with many other experts, we suggest that the best caviar serving temperature is 10 to 12°C, to bring out the flavors and the pleasant viscosity. At the colder temperatures, the interior liquid of the egg, may be too viscous and will never fully develop the characteristic aroma. Champagne accompanying caviar is best served at 6 to 8°C. Vodka Champagne can be colder. The following is a brief review of the types of dishes where caviar is used. Most recipes are for cold appetizers and hors d’oeuvres. The lower the grade of caviar used, the more sophisticated is the choice of ingredients to enhance the caviar. The bright black, red, orange and golden-yellow of caviar are used to design artistic color contrasts or color harmony. Caviar is put on all kinds of canapés, as either the main feature or as decoration and garnish. Caviar served on blini is a traditional dish. Blini are fairly thin pancakes made from wheat or buckwheat flour (the picture right below). Thicker pancakes made from grated potato are another favorite, known as latkes. Caviar is also used to put over baked potatoes to stuff halved or sliced vegetables or eggs, small tartlets, vol-au-vent shells and other suitable containers. These containers are usually first filled with another stuffing, then garnished with the caviar. Small containers may simply be with caviar. Among the extender stuffings often used are salads made of rice, canned salmon or tuna, diced vegetables, chopped– hard cooked eggs mixed with sour cream or mayonnaise. Cold or hot soups and main courses can also be garnished with caviar. Among favorite can be mentioned cold cucumber soup with sour milk, puréed potato soup, cream chowders and fish soups made from freshwater fish. These soups are served with a spoonful of sour cream floating in the middle. Caviar is sprinkled over the sour cream. Caviar must never be mixed so much that the individual eggs are broken. Caviar is used for garnishing all kinds of fish and shellfish dishes. Poached, baked or steamed fish of all descriptions, including halibut, salmon and sturgeon may be garnished with caviar. The flavor of many dishes based on shrimp, crab and lobster can be enhanced with small amounts of caviar. Even spaghetti and other hot pasta dishes can be served with sauces containing caviar. Caviar garnishings and dishes. Topping any dish with caviar must be done immediately before serving. If this is not possible, it is much better to present the caviar in a separate bowl and let the diners help themselves might surround the bowl of caviar with separate portions of finely chopped parsley, chives, white onions, sour cream and other accompaniments. Let your guests enjoy creating their own combinations of flavors. This style of serving can be used with canapés or crackers, as well as on all soup and hot dishes. 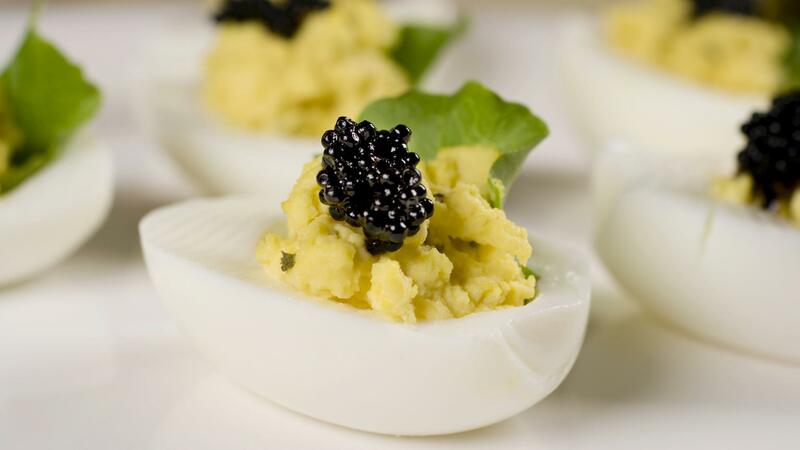 Stuffed eggs with Iranian Beluga caviar. 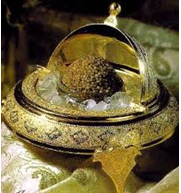 When caviar is served au naturel in appropriate crystal or china bowls, the bowls should be embedded in coarsely crushed ice held in a silver or metal container. Special cutlery is a must. Be careful not to serve caviar if you have doubts about its quality. It is interesting to serve several types of caviar au naturelat the same time. This creates opportunities to display the knowledge of the caviar world you retain. Full appreciation of this legendary product has much to do with psychological attitude. Classy serving style means having knowledge and displaying that knowledge as an important part of appreciating and enjoying caviar. The table below is an overview of 35 different options for using caviar as a garnish. These are grouped into five types of dish. Below each example is a list of suggested ingredients. You can choose from these when preparing the dish. 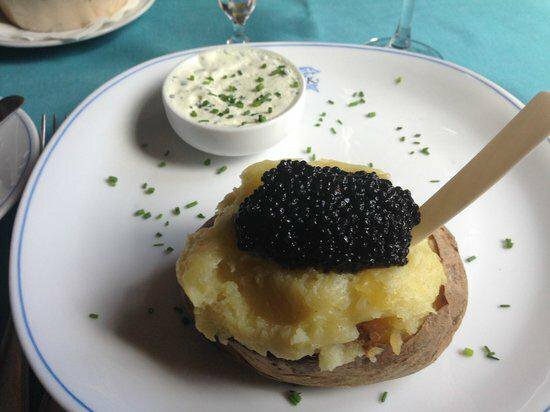 When garnishing hot dishes, such as soups or baked potatoes, it is advisable to apply the caviar over a layer of sour cream. bread; browned Unflavored; cherry tomato; crab salad; Vinegar; lemon wedge. yogurt pieces;diced potato. skim milk. We do not suggest in any way that these ingredient listings are comprehensive, nor do we show the proportions in which the ingredients might be used. Our aim is only to provide some basic ideas about the compatibility of caviars with certain other ingredients. Serving caviar is truly an art, and the creative chef and consumer will be able to invent numerous variations, without referring to cookery books.